Data collection for this research was conducted while the author was affiliated with the University of Manchester, UK. In this paper, I examine how instructors and designers can enhance educational practice by discussing a small-scale Adventure Learning activity designed within a higher education curriculum. To this date, Adventure Learning “has only been implemented as a distance education approach in the K-12 environment in the context of large-scale projects focusing on socio-scientific issues of global concern" (Veletsianos & Kleanthous, 2009, pp. 97). This paper fills a gap in research and practice by exploring the viability of Adventure Learning for small-scale interventions in higher education settings. Technological innovation has transformed diverse aspects of modern society including business, healthcare, and transport. Widespread access to the Internet, the availability and reduced costs of broadband, low cost of mobile devices, and familial and work commitments, have made online learning accessible and desirable to increasing numbers of students over the last ten years. For instance, enrolment in at least one online course as a percentage of total enrolment for higher education students in the United States has increased from 9.2% in 2002 to 25.3% in 2008 (Allen & Seaman, 2010). In other words, about 1 in 4 higher education students are now taking at least one online course. Indeed, the greatest enhancement that technology seems to have provided for education has been in terms of efficiency while effectiveness and engagement seem to have suffered as a result of the “strong pressures [that exist] to produce mediocre instructional products based on templates and preexisting content” (Wilson, Parrish, & Veletsianos, 2008, p. 42). Adventure Learning (AL) provides learners with opportunities to explore real-world issues through collaborative, authentic, and inquiry-based learning experiences within hybrid learning environments (Doering, 2006; Doering & Veletsianos, 2008, Veletsianos & Kleanthous, 2009). However, few Adventure Learning projects have been grounded on a clear theoretical and research framework (Doering, 2006). The one Adventure Learning project supported by theory and long-term research focuses on a multidisciplinary K-12 program entitled GoNorth! (Doering, 2007; Doering & Veletsianos, 2008; Veletsianos & Doering, 2010). This project follows the same storyline each year: a team of explorers and educators traverse an Arctic region of the world on a dog sledding expedition to engage learners with a freely available inquiry-based curriculum that explores socio-scientific issues of global concern (e.g., global warming). For example, the 2006 curriculum and activity guide is available here. Students can follow the expedition and participate in the learning experience via an online learning environment which is enhanced by electronic media sent from the trail, media sent from the trail, such as audio (Artifact 1) and video (Artifact 2) artifacts. Artifact 1. Complete White. April 28, 2010 audio update from the trail. Artifact 2. Narrow Trails in the Arctic National Wildlife Rescue. April, 2006 movie from the trail. 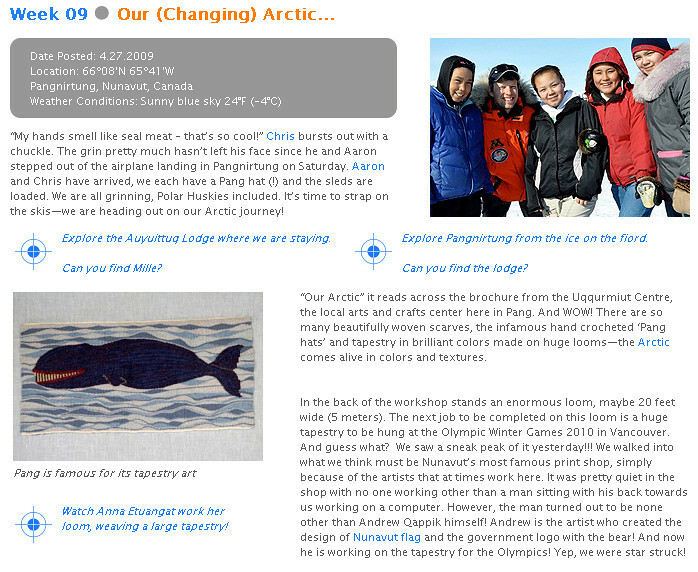 In addition to the video and audio artifacts, participants engage with the experience via numerous other media including weekly trail reports that present the expedition and adventure (Figure 1), a dog blog that presents the expedition through the eyes of one of the participating dogs, and collaboration zones where participants can interact in real-time with experts and each other. Other features of the learning environment include web-based video games relating to the issues of inquiry and region of travel, and opportunities for learners to send notes of encouragement to the explorers. Educational expeditions grounded on the Adventure Learning framework have been scarce (Doering, 2006). Yet, the appeal of this approach is demonstrated by (a) research efforts highlighting immersion in authentic practice (Herrington et. al., 2004; Lebow & Wager, 1994) and (b) worldwide attempts by explorers to actively involve classrooms in their expeditions. Examples of the most recent expeditions that have attempted to engage students in (curriculum-guided and adventure-based) distance education approaches include SouthPoleQuest and Polar Bears in a Changing Climate. A short description of the experience of trekking to the South Pole along with a sketch of student participation in one of these projects is provided by Ray Zahab in his 2009 TED talk embedded below (Artifact 3).embedded below (Artifact 3). In a recent metasynthesis of the Adventure Learning literature, Veletsianos & Kleanthous (2009) note that the AL approach to education is engaging and potentially powerful, while being flexible enough to be integrated by teachers in the way that they feel best fits their goals. For example, prior research has noted that a number of students sought to change their parent’s driving behaviour after learning about climate change and that a number of parents asked teachers to continue using the AL approach in their classroom. Although the Arctic projects undertaken demonstrate the possibilities and excitement afforded by this approach, research on small-scale Adventure Learning activities within higher education is lacking. Participants in this activity were thirty face-to-face and distance learning graduate students pursuing a degree in educational technology. Face-to-face students were in their second semester of study, and distance learning students were either in their second or fourth semester of study. The course in which this particular activity took place focused on the foundations and use of emerging technologies for education. The developed activity was grounded on a set of practical guidelines proposed by the Learning Technologies Collaborative (in press) to guide the design of “mini” Adventure Learning projects (Figure 2). These guidelines were used as the basis for designing the activity, but were also adapted to fit the curricular and pedagogical needs of the course. Specifically, providing opportunities for interaction between learners and experts/professionals was an integral part of the design, influencing how the design guidelines were conceptualized. The design of the learning activity is described below. In this stage, the issue/problem that an instructor wants to investigate is delineated succinctly and clearly. The purpose of the AL activity in this situation was for learners to explore openness in education and, in particular, to critique, discuss, and assess how web technologies have “opened up learning to the point where anyone can learn anything from anyone else at any time” (Bonk, 2009). The second stage of the model calls for identification of the location, populations, and experts that relate to the issue under investigation. The location to be explored is the Internet along with associated web 2.0 technologies in the context of enabling open and free access to resources, knowledge, and learning. In this activity, the students were the main participants and the instructor of the course was the designer of the activities. The students also interacted with two experts, one of which was the course instructor. The second expert was a Professor of Education with a deep knowledge of the topic under investigation. This person’s contribution is further described in the next stage. At this stage, a curriculum and online learning environment are designed. The curriculum in this specific instance was grounded on ideas of scaffolded inquiry (Brown & Campione, 1994; Reiser, 2004) and situated learning (Lave & Wenger, 1991). The learners were first asked to individually (a) watch a recorded keynote speech by the identified expert, (b) read a set of relevant papers on the topic, and (c) write two questions that they wanted to ask this individual. Student questions were collected via a web-based form and it was observed that the questions fell into four broad themes. The themes and accompanying questions were then sent to the expert who replied to the questions via a video posted on a video-sharing site. Finally, students were asked to watch the expert’s reply, respond with their own comments, and discuss the issues that related to the topic of investigation. The process was facilitated by a Wiki that served as the learning environment for this activity. You are a learning designer working for the University. Your manager has asked you to develop a freely-available online resource that answers the question: What is it like to study for a Master of Arts program at this University? When developing this resource, consider the lessons learned so far. Importantly, this task allowed flexibility within a real and relevant scenario, while enabling learners to further take an active part in the learning process. Further, the resources developed served as user-generated examples of the topic of investigation, while serving as authentic case studies of openness in the next stages of the learning activity. Once the learners developed their resources (e.g., blogs, videos, social networking sites), these were then shared on the online learning environment (i.e. the class Wiki). Both at this point and on the discussion space provided by the wiki, the learners critiqued and discussed the developed resources to reach new understandings relating to the curricular goals identified in the define step. Learners discussed the issue of openness and examined how web technologies have enabled educators to share content, resources, and expertise on the Internet, while at the same time, investigating the structures that hinder free and personalized online learning. The collaborate step calls for peer-expert, peer-instructor, and peer-peer collaboration to discuss the experience. This step is the one that, at least in this activity, was dispersed throughout the experience. Collaboration happened at nearly all stages of the activity, as well as at the end of the activity when students discussed their resources with their colleagues. For instance, learners developed online resources in teams and asked questions of each other in relation to their resources and wiki postings. Finally, throughout the activity, learners were encouraged and supported to explore ideas and issues relating to openness, technology, digital divides, and online education. Questions discussed included: Are new technologies opening up education? What does openness mean? Who benefits from open resources? What are the implications of openness for organizations (e.g., universities), current practices (e.g., accreditation), and the individual? What are the purposes of education and what is the role of the educator and the university, and how are networked technologies influencing these? What are the difference between knowledge and learning? Is “open education” a goal we should strive towards? The learning experience with respect to this activity was evaluated via (a) web analytics data and (b) an anonymous student questionnaire. In their Framework of Experience, Wilson and Parrish (2009) argue that investigating the learning experience means taking a deep and holistic look into situational and individual qualities of a learning experience. Examples of situational qualities may be the extent to which an experience is compelling or immediate, while an example of an individual quality may be the extent to which a learner is willing to invest mentally and emotionally in the experience in anticipation of future outcomes. Therefore, it is important to note that while the experiences described below are generally positive, one needs to recognize that personal qualities brought in the experience influence its outcomes. Web analytics refers to “the measurement, collection, analysis, and reporting of Internet data for the purpose of understanding and optimizing Web usage” (Web Analytics Association, 2005). Data collection through web analytics is a powerful method to track learner behaviors and activities, and is an approach that is poised to influence the design and evaluation of distance education (Rogers, McEwen, & Pond, in press). In this investigation, I used Google Analytics as the web analytics application because of its extensive reporting capabilities and ease of integration with the online learning environment hosting the Adventure Learning activity. Comparative web analytics data indicate that this activity was popular: The Wiki page hosting the Adventure Learning activity was the third most visited page out of all the weekly session pages (the Learning Platforms page and the Web 2.0 & Co-construction of knowledge pages being the top two). Average time spent on the wiki across all pages was 2 minutes and 19 seconds, while the average time spent on the Adventure Learning page was 4 minutes and 5 seconds (in comparison, the average time spent on the page describing student assignments was 3 minutes and 44 seconds). Note that even though the AL page included an embedded video of the expert’s response that may have influenced time spent on the page, numerous other pages throughout the course also included embedded videos of similar length. The majority of responses to the survey questions with regards to the learning activity were positive, with students describing their experience as “active,” “motivating,” “innovative,” “inspiring,” “fun,” “enlightening,” and “fascinating.” One student summarized these feelings succinctly: “It was an interesting experience, educational but at the same entertaining. It was really enjoyable.” The negative feelings towards the activity related to the limited amount of time the students had to complete the exercise. Finally, it is also important to address the qualities that individuals brought to the learning experience. While a few learners highlighted the situational aspects of their experience (e.g., “We need more of these activities that we just ‘do’ things and we are active”), engagement also depends on individual qualities. For instance, Figure 3 shows visits from a city in which one of the distance students resided during the teaching of this course. This student visited the Wiki 24 times (on 11 different days). The graph above indicates that this student’s learning experience was sporadic and fragmented. The student visited the site once during this learning activity and did not participate in the discussion with the expert. While this student may have been unable to participate in this specific activity for a number of reasons relating to pursuing a degree at a distance (e.g., work schedule), the overall activity shown on the graph above indicates a low engagement overall. As a comparison, two students who resided in a different city visited the Wiki 249 times (or, about 125 times each), and one student who resided in yet another city visited the Wiki 147 times (Figure 4). Finally, it is important to note one additional attribute of the graphs that highlights the different levels of motivation and initiative that existed between the students: The University was closed for the Easter holidays in the period between March and April. Prior to this, students were reminded that this period would have been a good time to work on their final assignment since they were not assigned any other tasks. The graphs show that the student depicted in Figure 3 did not visit the Wiki at all during that time (flat line between March and April) while the student depicted in Figure 4 visited the Wiki multiple times (further analysis of the logs indicated that the student in Figure 4 also visited the page describing the final assignment). To summarize, overall, the student experience in the Adventure Learning project can be described as engaging and appealing. Learners cherished the situational qualities of the learning experience, but individual engagement with the learning activity varied. They appreciated the practical and participatory nature of the experience, and valued its active and personalized aspects. Evidence to the personally meaningful and compelling learning experience is the fact that at the end of the activity, students, on their own volition and discretion, invited friends from outside the course to participate in and use their developed resources. The desire to share university work with individuals that are close to the students (e.g., family and friends) reveals the value that the students placed on this experience. Student comments shed light on the situational qualities of the learning experience allowing us to draw implications for the design of small-scale Adventure Learning projects. Specifically, this investigation highlighted the links between powerful pedagogy, social media affordances, creative curricula, authentic practice, and narrative. 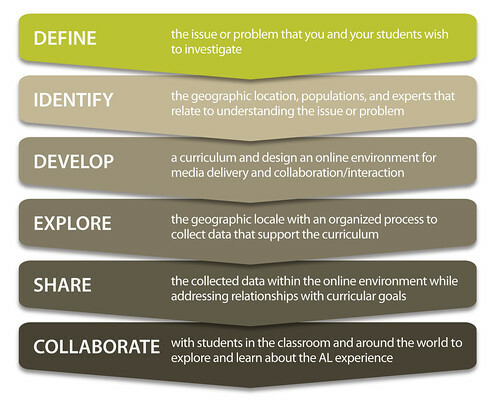 An informed understanding and appreciation of how these five issues relate to each other can enable practitioners, researchers, and designers to harness the seamless integration of technology in education via the Adventure Learning approach. Learners are interested and intrigued by the real world, the world that exists beyond the classroom walls, and not in simplified representations or textbook examples of the world presented in the classroom. Additionally, student interest and curiosity relating to the real world is not limited to K-12 settings: the learning activity and it’s associated outcomes discussed above demonstrate that curiosity and interest in the real-world exist and can be utilized in higher-education learning endeavours. Learners enjoyed engaging with a topic in a real-world context, asking questions to a real-world expert, and developing authentic materials for possible use. Further, technology, and social media in particular, extend beyond enabling expert-learner collaboration. Participation in networks of practice can take many forms: Students can participate in virtual explorations of building sites to learn mathematics, archaeological areas to learn history, drainage basins to explore ecological processes, and court deliberations to investigate the application of law. Students who are investigating a career choice can follow the day-to-day happenings of artists, bankers, brokers, video game programmers, nurses, and any other profession imaginable effortlessly and synchronously. Importantly, Web 2.0 technologies have diminished conversational obstacles and made interaction between participants more feasible, cost-effective, and manageable. Take the example of a group of students learning about the craft of carpentry and following the day-to-day activities of a carpenter. The carpenter could keep a blog where s/he could post reflections of the day’s activities along with other relevant information such as images of his/her designs and video of his/her ongoing activity. The images and video could invite feedback and scaffolded inquiry via a number of social tools (e.g., Voicethread). Furthermore, recent developments on the web have allowed networked participants to be alerted of news and messages as they are published (i.e. in real-time), and these developments may allow greater immersion in a learning experience. For instance, medical school students can participate in a learning adventure of what it means to be a doctor by subscribing to receive a doctor’s microblogging feed via text alerts on their mobile phones. In this way, when the doctor is called in for an emergency in the early hours of the morning, for example, the learners can be alerted of the event, thus gaining vicarious, but immediate and first-hand, experience of the profession. The ability to exchange real-time messages can bridge physical and virtual experiences, and relay a sense of immediacy and connectedness that may heighten the learning experience. Knowledge dissemination in the form of information delivery fosters passive, dispassionate, and noncritical learners (Freire, 1970), along with poor learning experiences. “Pure” discovery-based (or, completely-unguided) methods are ineffective with individuals who are not self-directed or with those who do not have the prerequisite background knowledge. Returning to our Adventure Learning example, a visit to a (virtual or physical) space needs careful examination and development of a creative curriculum, along with support from inquiry- or problem-based pedagogy that is truly guided or scaffolded (Hmelo-Silver, Duncan, & Chinn, 2007). Such pedagogy should strive to support and extend learners’ thinking, skills, and learning beyond their current levels, in what Vygotsky (1978) called the Zone of Proximal Development (ZPD). Importantly, a learner’s thinking and knowledge can be expanded via interactions with the instructor, other experts (see previous section), other students/colleagues, and mediating artifacts (e.g., museum objects or virtual objects). One of the premises of this paper therefore is that learning experiences need to be enhanced in ways that invite participation, inquiry, and immersion in authentic practice. One example that highlights these ideas comes from Doering et. al. (2009) who describe an online learning environment in which real geographic problems are presented to learners. 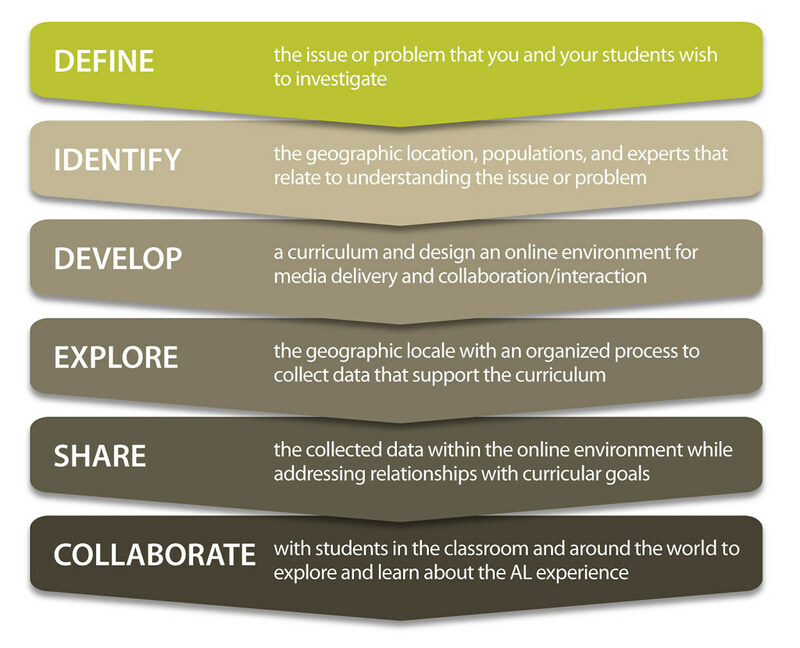 In this environment, learners take on the role of geographers that solve authentic problems based on real-world data, and are invited to present solutions to real organizations. The problems are relevant and contemporary, and learners are asked to use tools employed by real geographers to solve real problems. For example, one module asks learners to decide where would be the best location to build a new football stadium given data relating to income levels, population density, competing football teams, etc. Even though the ideas of narrative and storytelling within technology-enhanced learning and instructional endeavours are still emerging forms of practice and research (Andrews, Hull, & Donahue, 2009; Brna & Luckin, 2008; Hokanson & Fraher, 2008), narratives are pervasive in our everyday lives as they are embedded in human cultures and oral tradition. A narrative structure brings together the learning experience and its diverse activities under a unified purpose, establishing continuity and coherence to learning experiences that span across multiple media and information spaces (Hazel, 2008). In the example of the Adventure Learning project described above, both the activity and learners’ participation in it reside in multiple spaces (e.g., wiki, website hosting the expert’s keynote, face-to-face meetings). Navigating these spaces can be both confusing and difficult. Structuring the experience in terms of a narrative however, establishes a sequence and a storyline, and enables the multiple pieces of the experience to form a uniform whole. Additionally, narratives serve purposes beyond the establishment of continuity and coherence (Hokanson & Fraher, 2008) as they allow (and encourage) creativity and imagination in learning design, enabling effective, enjoyable, and entertaining learning experiences. In the case of the activity described in this paper, the “story of openness” could have been told in multiple ways: It could have been presented as a narrative of hope, a narrative of opening up access to everyone regardless of socio-economic status; or, the story could have taken a narrative of liberating learning from institutional control. The way a story is told is important: plots give stories their power and enable conveying of meaning, which is part of the reason that narrative and storytelling have been proposed as viable approaches to teaching (Kieran, 1985). In this situation, the story of openness took on a narrative of possibilities: the possibility of learning from a well-known expert, the possibility of the expert answering learner questions, and the possibility of others discovering the open educational resources that students developed. The results discussed above, highlight the exciting, engaging, and meaningful aspects of these possibilities. In this paper, I presented a small-scale Adventure Learning activity designed within a higher education curriculum. Results from the implementation of this activity are promising and highlight the viability of Adventure Learning in the context of (a) small-scale projects and (b) higher education settings. To facilitate the development of small-scale AL projects in higher education (and to enhance higher education practice) we need to rethink education in terms of pedagogy, social media, creative curricula, authentic learning, and narrative. Rather than thinking about products (e.g., courses contained within learning management systems), we need to think of experiences, engagement, and interaction, and view ourselves as designers of learning experiences. Such experiences should foster participation and interaction, be situated in authentic practice, and be supported by creatively designed pedagogies and curricula. Future advances in small-scale Adventure Learning implementations can provide valuable information to enhance educational practice and inform implementations that cross disciplinary lines. Future research should investigate how to effectively prepare educators in designing their own Adventure Learning projects, examine the extent to which adventure learning projects enable similar outcomes, explore how to best scale such projects, and further delineate how to design engaging and powerful adventure learning experiences. The Adventure Learning activity described in this paper represents a model of education that has the potential to (a) resonate with designers and academics, while (b) transforming formal practice in higher education institutions. We need to stop positioning our hopes of improving education on one item (most usually technology), and envision integrative approaches to learning that not only solve problems but also change the nature of education and reconsider the kinds of experiences that we offer to learners. To do so, we need to reflect on the purposes of education and review the role of the physical classroom in the world. Bednarz, S.W., & van der Schee, J. (2006). Europe and the United States: The implementation of geographic information systems in secondary education in two contexts. Technology, Pedagogy, and Education, 15(2), 191-205. Brna, P., & Luckin, R. (2008). Narrative and interactive learning environments. Interactive Learning Environments, 16(3), 195-197. Couros, A. (2009). Open, connected, social - implications for educational design. Campus-Wide Information Systems, 26(3), 232-239. Hazel, P. (2008). Toward a narrative pedagogy for interactive learning environments. Interactive Learning Environments, 16(3), 199-213. Herrington, J., Reeves, T., Oliver, R., & Woo, Y. (2004). Designing authentic activities in web-based courses. Journal of Computing in Higher Education, 16(1), 3–29. Hokanson, B., & Fraher, R. (2008). Narrative structure, myth, and cognition for instructional design. Educational Technology, 48(1), 27-32. Johnson, D. W., & Johnson, R. T. (2004). Cooperation and the use of technology. In D. H. Jonassen (Ed. ), The Handbook of research for educational communications and technology (pp. 785-811). Mahwah, NJ: Lawrence Erlbaum Associates. Egan, K. (1985). Teaching as story-telling: A non-mechanistic approach to planning teaching. Journal of Curriculum Studies, 17(4), 397-406. Lebow, D., & Wager, D. (1994). Authentic activities as a model for appropriate learning activity: Implications for emerging instructional technologies. Canadian Journal of Educational Communication, 20(3), 231–44. Parrish, P. (2008). Plotting a Learning Experience. In L. Botturi & T. Stubbs (Eds. ), Handbook of visual languages for instructional design: Theories and practices (pp. 91-111). Hershey, PA: Information Science Reference. Reiser, B. J. (2004). Scaffolding complex learning: The mechanisms of structuring and problematizing student work. Journal of the Learning Sciences, 13(3), 273-304. Rogers, C., McEwen, M., & Pond, S. (in press). The use of Web analytics in the design and evaluation of distance education. In Veletsianos, G. (Ed. ), Emerging technologies in distance education. Edmonton, AB: Athabasca University Press. The Learning Technologies Collaborative (in press). “Emerging”: A re-conceptualization of contemporary technology design and integration. Using emerging technologies in distance education. Edmonton, AB: Athabasca University Press.